After the Beetle and the Microbus, the svelte, feline Karmann-Ghia is probably the most recognizable car from Volkswagen’s past. The Beetle got a rebirth as a modern car, and Volkswagen has teased a new Microbus with concepts for years and years. So why not a reborn Karmann-Ghia? While VW seems oddly uninterested, their partner (now subsidiary) Karmann has actually given it a go. More than once. The Karmann-Ghia was an interesting idea: a sporty car built on the platform of a mass-market economy car, and with no real pretensions of performance. It was all about the look, and that it had down so well, nobody really cared how slow it was. The Ghia was a fun car that’s quite fondly remembered by many people, and while Volkswagen has had a number of cars that roughly filled the role of the Karmann-Ghia—Scirocco, VW-Porsche 914, and Corrado on the more performance-oriented side, and the Cabrio and Eos on the more fun-convertible side—there really hasn’t been a car that’s quite filled the niche of the original Karmann-Ghia. What I never realized, though, is how often Karmann attempted to resurrect the Karmann-Ghia. By resurrect, I mean something specific: Karmann made a number of possible Ghia replacements and redesigns while the Karmann-Ghia was still being built, and VW had alternate Karmann-Ghias for the Type III platform, and Brazil had its own as well. These aren’t what I’m talking about now. What I’m talking about are concept cars created at Karmann long after Karmann-Ghia production ended in 1974. Concepts that are clearly aesthetically designed based on the look and styling cues of the original Ghia. From what I can tell, Karmann made at least three such attempts to rekindle interest in the Karmann-Ghia. The first is from 1991, and was called the Karmann Idea. This one is a small Miata-like roadster, but has just enough styling cues from the original Ghia to make me think it deserves inclusion here. The under-bumper grilles vaguely echo the shape of the original’s twin whisker-fresh-air-intake-grilles, the profile has the rear fender hump like a Ghia, and the third brake light arcs across the rear deck, sort of suggesting where the old Ghia’s engine air intake vents were. This one’s a bit oblique, but I think the OG Ghia was the inspiration. Next, in 1997, we have the Karmann AFS. AFS stands, deliciously, for Aluminum Foam Sandwich, a novel new method of construction that Karmann was experimenting with. To show off their new AFS capabilities, they built a concept car. Well, really they built half a concept car, since it only had half a body, the other half remaining open to see the novel AFS construction. The bodied half, though, was the most clear and obvious update to the original Karmann-Ghia ever seen from Karmann. The line of the greenhouse and the distinctive rear quarter window/C-pillar is there (though now it looks like it sports a suicide rear door), the rear lights are vertical like a K-G, there’s a detail on the trunk lid that suggests the license plate light housing of the original, up front the shape of the nose and the presence of the whisker grilles are a dead giveaway. This looks like a modernized Karmann-Ghia. It’s a shame they only went halfway. Finally, in 1999, it seems like someone at Karmann finally took another look at the clothed half of the AFS and decided, hell, why aren’t we making a new Karmann-Ghia? This one was called the Karmann Coupé, and they built two—a coupé and a convertible. The look is undeniably modernized Ghia, with all the design traits you’d expect: the twin whisker grilles, central hood crease, greenhouse/C-pillar shape, the curvy rear haunches, vertically-oriented taillamps, license plate light housing, and so on. If that’s not enough, the cars sported the exact same distinctive chrome badge that was on all Karmann-Ghias. This was absolutely intended to be a new Karmann-Ghia. It looks like it was built on a contemporary Golf/New Beetle/Audi TT platform. and it’s quite fantastic-looking, I think. I have no idea why Volkswagen decided to go with the Eos instead of this reborn Ghia. 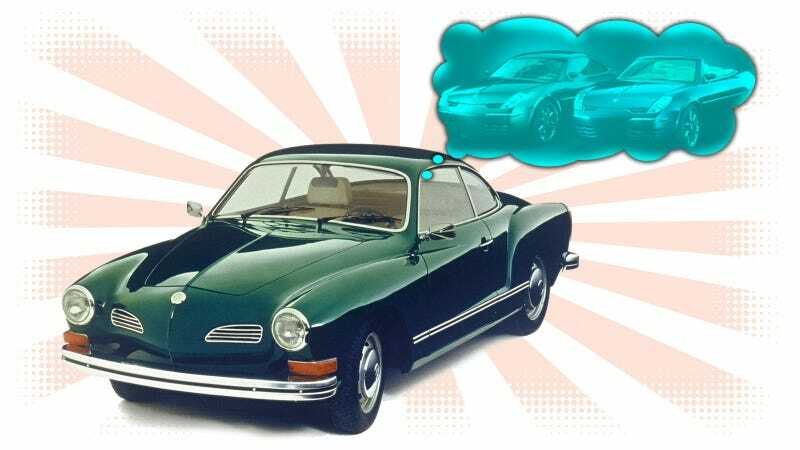 A new Karmann-Ghia would have made a great entry-level sibling of the Audi TT, and would have taken advantage of the renwewed intrest started by the recently-released New Beetle. I feel like VW really misstepped with this one, especially since Karmann had already done the hard design work. But, it didn’t happen, and nobody asked me about it, anyway. It’s still not too late, though. Karmann is now a wholly-owned subsidiary of VW, so maybe they should head down to the vault, dust off the Coupé, and start seeing how it fits on their modern MQB platform. Why doesn't VW ever listen to me?